I'd like to share a little about the Regional Meeting our Abbot Fr. Paul Mark and I attended at Mepkin Abbey in South Carolina Feb. 21 – 26. I had accompanied the abbot to serve as one of the secretaries. 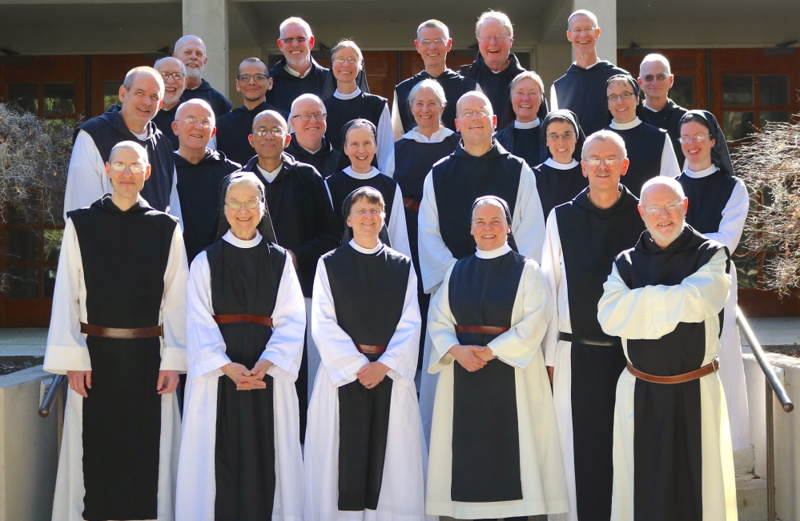 For those who are not aware, the Regional Meeting is the yearly meeting at which all the superiors of the 15 houses of the US Region of the Cistercian Order of the Strict Observance, both abbots & abbesses, gather at one of the monasteries to discuss and address common concerns and pastoral needs. In addition to the Superiors and elected delgetes, five invited guests were also present: Dom Clément Charbonneau, abbot of Abbaye Notre-Dame de Mistassini, gave a report on the Canadian Region; Dom Peter Verhalen, O. Cist, abbot of Our Lady of Dallas, spoke on the Regular Observance Cistercians. Dom Timothy Kelly, the Procurator General was there to represent the Generalate in Rome. Mrs. Sue Schuttinger, Regional Director of Digital Communication gave a report on the Regional Social Media efforts; and Br. Cassian Russell of Holy Spirit Abbey as Director of Formation. It was a tight schedule; the Superiors were here to work! The sessions began right after Mass and continued until lunchtime, then after the mid-day break continued until supper. The main thing that I take away from the experience was that I was greatly impressed and edified by the way the Superiors worked together. You could tell in the discussions that there were times when there were definitely difference of views but there was always respect and fraternal care, real listening. I remember thinking many times that I wished our nation could learn to dialogue like this. I think the difference was that this way of dialoging is the fruit of faith: love for each other as brothers and sisters in Christ and monastic vocation, and a real humility and trust in the Holy Spirit. Each person made his or her contribution, but there was a letting go and letting the Holy Spirit work, to shape and bring things about as He wishes. So that was beautiful to see.